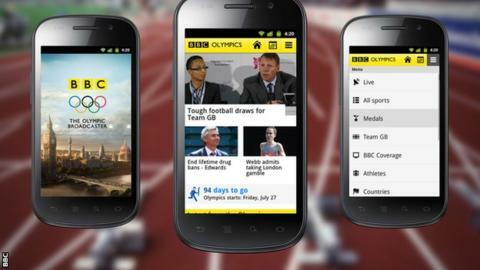 BBC Sport's Olympics app for Android and iOS smartphones has been downloaded more than 500,000 times since its launch. The UK-only app ensures you will never miss a moment of the London 2012 Games, even while on the move. It provides up to 24 streams of live coverage, detailed schedule and results pages, and daily news stories. Alongside full live streaming, catch-up coverage and highlights, the app offers facts, statistics and information for every athlete, country and sport. The user can access live daily text commentaries, news stories and a detailed schedule and results section covering every Olympics event. Stories can be saved for offline reading, ensuring the latest information is accessible even when mobile reception is unavailable. Additionally, iOS users can personalise the app by adding their favourite Olympics sports to the customisable tab bar, enabling quick access to the latest live action. BBC coverage of the 2012 Olympics can also be enjoyed on mobile phones via the mobile browser version of the BBC Sport website.